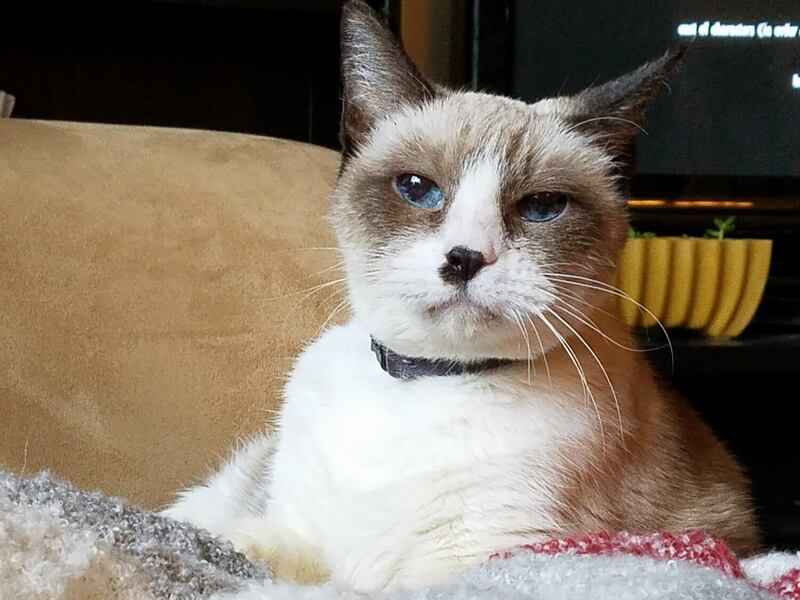 Eliot is a gorgeous and silky soft 12-year-old snowshoe Siamese mix. She is extremely cuddly and has a lot of personality! She is currently living in foster with two children and is very tolerant of being handled, though she has a bit more of an independent side than her feline foster brother. She definitely craves attention and snuggles but is perfectly fine to spend several hours a day focusing on some serious nap time. She also enjoys playtime and will often engage in an adorable wrestling match with JoJo, though he is usually the instigator! She is a very confident kitty and is not timid in the slightest. She has no problem being around the hustle and bustle of a busy family, but would also do well in a quieter home with less activity. She would also be perfectly fine being left alone for a full 8 hour day if needed, and would just ask for cuddles as soon as her person came home. She also just LOVES to be brushed, though she doesn’t have long fur and doesn’t shed much. She has had recent bloodwork and, like her feline foster brother, has her health regulated with Methimazole which she takes daily. She is otherwise in really good health and has the looks and personality to win almost anyone over! Are you interested in snuggling this sweet Siamese? Fill out an application to meet her today! She comes to you fixed, vaccinated, and micro-chipped for an adoption fee of $80.